Learning from Life: Live what you believe! I love this story, see if after reading this it reminds you of someone you know. They are the best living proof of the scriptures that you know! We all need to be more like this and we definitely need more friends like this, if we did then think what a better place this world would be. Thanks for the examples of kindness you have been to me. Good night dear friends. His name is Bill. He has wild hair, wears a T-shirt with holes in it, jeans, and no shoes. This was literally his wardrobe for his entire four years of college. He is brilliant. Kind of profound and very, very bright. He became a Christian while attending college. One day Bill decides to go there. He walks in with no shoes, jeans, his T-shirt, and wild hair. The service has already started and so Bill starts down the aisle looking for a seat. The church is completely packed and he can't find a seat. By now, people are really looking a bit uncomfortable, but no one says anything. Bill gets closer and closer and closer to the pulpit, and when he realizes there are no seats, he just squats down right on the carpet. By now the people are really uptight, and the tension in the air is thick. About this time, the minister realizes that from way at the back of the church, a deacon is slowly making his way toward Bill. Now the deacon is in his eighties, has silver-gray hair, and a three-piece suit. A godly man, very elegant, very dignified, very courtly. He walks with a cane and, as he starts walking toward this boy, everyone is saying to themselves that you can't blame him for what he's going to do. How can you expect a man of his age and of his background to understand some college kid on the floor? It takes a long time for the man to reach the boy. 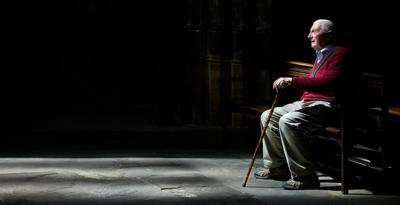 The church is utterly silent except for the clicking of the man's cane. All eyes are focused on him. You can't even hear anyone breathing. The minister can't even preach the sermon until the deacon does what he has to do. Everyone chokes up with emotion. When the minister gains control, he says, "What I'm about to preach, you will never remember. What you have just seen, you will never forget." "Be careful how you live. You may be the only Bible some people will ever read!"